Compared with the previous months, October's astrological line up is calm. The new moon in Virgo on October 10 falls in the healing nakshatra of Hasta, symbolized by the hand. Hasta's power is the ability to manifest what we are seeking and to place it in our hands, hasta sthapaniya agama shakti. Make sure you set clear intentions and be ready to receive with an open hand, while trying not to control with a closed fist. Virgo is ruled by the planet Mercury, and on the following day Mercury stations and goes retrograde thus increasing the effect of this lunation on the thinking mind. Mercury will transit its third and last retrograde in an air sign this year, Libra. It will be retrograde between October 11 and November 1, 2007 in the nakshatras Swati and Chitra. Swati's shakti, pradhvamsa, is the power to scatter like the wind. Ruled by the deity Vayu, the god of wind, air, breath and prana, Swati promises change. If you are flexible and able to bend with the wind, this retrograde cycle promises to purify and cleanse. The goddess of learning and scholarship, Saraswati, is also associated with Swati. This period would be a great time to review what we know, or think we know. As retrograde planets are often more powerful, we may develop new insights, receive new information, or reassess old belief systems during this time. 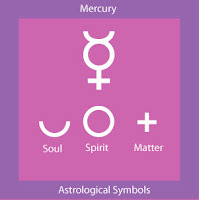 Mercury will retrograde back to and station in the nakshatra Chitra which gives the power to accumulate merit. Revisionists may find a more receptive audience at this time. The full moon on October 25, 2007 will be in Aries, in my favorite nakshatra, Ashwini. The Ashwins are the twin physicians of the gods who bring light, happiness and bliss to all that they touch. This second healing lunation of the month promises quick cures and rejuvenation of the body, mind and spirit. Miracles are associated with this lunar mansion. The Moon's opposition to Mercury will cast an extremely abstract but intuitive light on our thinking minds, which will followed a few days later by Neptune's direct station on Halloween and Mercury's direct station on November 1, 2007. Neptune is the planet of otherworldly beauty and illusion. The end of the month promises to be a period when the communication between the veils will be more accessible than ever. What comes through may be spellbinding, so be sure to use a clear, open mind to discern guidance from illusion. These are uplifting words, Liz. Thanks. It's interesting to note that the Full Moon occurs right in the middle of His Holiness the Dalai Lama's visit to Bloomington IN. I look forward to being in a receptive mode that week while working hard in my volunteer post!